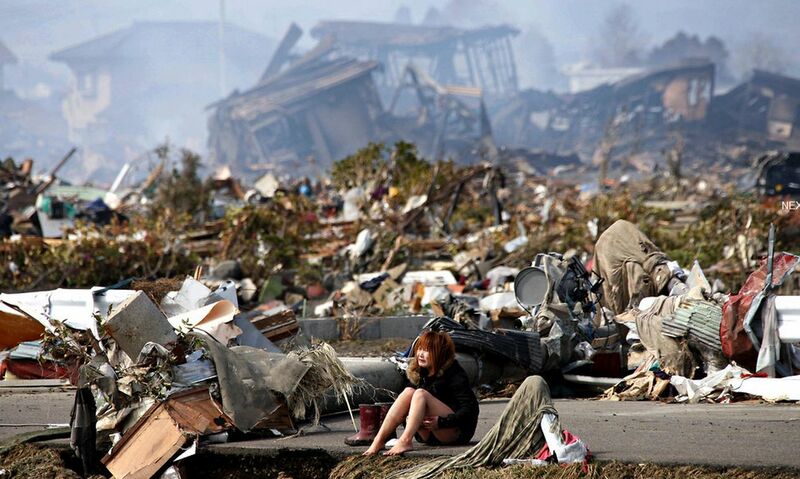 In the aftermath of the tsunami, a woman sat amid the debris in Natori. There are a lot of images online now of the tragic state of Japan after the quake and the tsunami. This collection from the NY Times is possibly the “best” out there ” (calling them the best really does not seem right, but they are truly great photos, in the sense of their ability to touch emotion and tell a tragic story). Help The Recovery – Donate To The Japanese Red Cross using Google: http://www.google.com/crisisresponse/japanquake2011.html – Your donation must be between 100 and 50,000 yen (2000 yen is approximately 25 US dollars). The sheer scale of the disaster is just unimaginable. Some photos show the fast work that has been done already, with roadways cleared through the debris. But with boats and cars on top of houses, entire towns turned to tinder sticks, roads packed solid with cars and other crushed items, it is impossible to imagine that this part of Japan will ever recover. Latest news is that there has been another explosion at a nuclear power station, another 6.4 magnitude quake, and increased warnings over possible radiation leaks and further tsunamis. People are still mostly living in the dark, both in terms of information and electricity, and to top it all it is looking to be a nasty winter, with snow blizzards blowing in.